Innovation is crucial for growing a business in today’s increasingly competitive global marketplace. In fact, 61% of CEOs surveyed in a recent PricewaterhouseCoopers report said that innovation is a priority or a primary focus of their business strategies. But creating an environment that fosters innovation and creativity can be a tough code to crack. 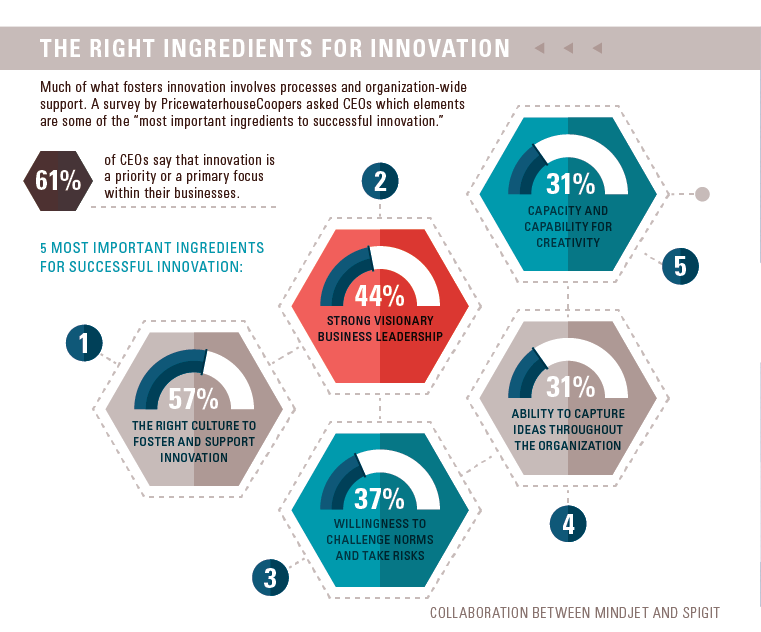 Based on the survey, Mindjet put together an infographic that illustrates the key ingredients a business needs to build an innovative work environment. Unsurprisingly, a culture that is supportive of innovation tops the list, followed by strong visionary leadership and a willingness to take risks and challenge organizational norms. View the full graphic on Mindjet’s blog. Do you agree with the survey’s findings? Let us know in the comments. The Right Ingredients for Innovation. Image: Flickr, Dell Inc.